Please note that the content of this book primarily consists of articles available from Wikipedia or other free sources online. 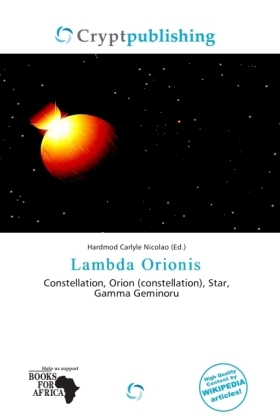 Lambda Orionis is a star in the constellation Orion. It has the traditional names Meissa or Heka. "Meissa" derives from the Arabic "Al-Maisan" which means "The Shining One". This term was used for Gamma Gemini, but was somehow also mistakenly applied to Orionis and the name stuck. Meissa is actually a binary star system. The fainter star is of magnitude 6 and is 4.4 seconds of arc away from the brighter. It is a hot blue-white dwarf of spectral type B0.5 V.